When war with Germany was declared on 3 September 1939 the nation readied itself for invasion. Road blocks and barricades sprang-up in towns and cities, with military personnel guarding strategic sites. Barrage Balloons began to appear in the skies and the sound of air-raid sirens being tested became a familiar, if alarming, part of daily life. Communal air-raid shelters started to appear, households were issued with the materials to build their own ‘Anderson’ shelters and plans were made for the evacuation of thousands of school children from the cities to the countryside as the nation prepared for the worst. With its shipyards, coal fields and factories all engaged in the war-effort, the industrial north east became an obvious target for the Luftwaffe. The first recorded raid on the townships of Stockton occurred on the night of 6 June 1940 when a German raider dropped his bombs onto Thornaby Aerodrome. Two aircraft were destroyed on the ground, along with two fuel bowsers, and the runway itself suffered some damage. A number of service personnel were injured one of whom later died from his injuries. Two nights later, on 8th June 1940, another raider dropped a stick of bombs which hit the airfield perimeter causing little damage. On the night of 19 June 1940, just after 11pm, the air raid sirens sounded to herald the first major raid on the area which was to last more than 3 hours and involved more than 100 enemy aircraft. At Billingham, ICI factories were bombed with two soldiers being killed at ICI South Works and water and gas pipes in the surrounding areas being badly damaged causing major disruption.. A High Explosive (HE) bomb was dropped in Cowpen Bewley Road, causing some slight damage to Haverton School, with shrapnel later found embedded in a classroom wall. Another HE bomb landed at Billingham Bottoms blasting out a huge crater 20 feet across and damaging one of Norton’s oldest buildings, Norton Mill. Again ICI was the target. The Malleable Works in Stockton took direct hits on the ‘tank shop’ in Dugdale Street and on the gas tanks at the east end of the site with another two HE bombs hitting the stock yard, causing thousands of pounds worth of damage and disrupting steel production. This was to be the start of almost three years of intermittent bombing raids. Casualties and damage were comparative light on this occasion, subsequent raids would cause many more casualties and more damage. In the three month period following this attack, the air raid sirens would be heard several times a day on most days and nights. The next major raid was at midnight on the night of 26/27th June 1940 with properties in Bilsdale Crescent and Cleveland Avenue, Haverton Hill and Lincoln Crescent and Cowpen Lane, Billingham being damaged. ICI was again hit by HE and Incendiary bombs causing a number of fires which were dealt with by ICI’s own firefighters. One HE bomb damaged the 33 inch water main in Belasis Lane causing major disruption. Anderston’s Foundry at Port Clarence was hit by an HE bomb which interrupted production and at the same time the Transporter Bridge was hit, with one bomb going through the roof of the cable car and power cables. The support towers on the south side of the Transporter bridge are still out of line as a result of this raid. The shipyards made an easy target as the German pilots were able to follow the line of the river. On the night of 7/8th July 1940 the Furness Shipyard was hit with four HE bombs which did considerable damage to the yard but none of the ships under construction suffered anything more than shrapnel damage. On the following night a raid on Billingham resulted in the death of some livestock in the vicinity of Saltholme Farm. Although the alerts continued, the next big raid on Stockton wasn’t until the night of 24/25th August 1940 when ICI Billingham was again hit with fires breaking out and damage to the water supply. The bombing continued the next night with a much larger raid causing the first civilian death in the area when Harold Elwes of 55 Laurel Road, Stockton was hit while crossing the Victoria Bridge on his way to work. HE bombs landed on both sides of the river close to the bridge causing a great deal of blast damage to properties on the East side of Stockton High Street as well as injuring Mr Elwes who died on his way to hospital. One bomb blew a huge crater at the junction of Thornaby Road and Mandale Road and Cleveland Flour Mill and a number of surrounding properties were also damaged. Blast damage was caused as far away as the Five Lamps at Thornaby. During the course of this raid sixty five shops and more than one hundred houses were damaged and gas pipes were ruptured. The shrapnel damage to the Victoria Bridge can still be seen on the cast iron balustrades to this day. 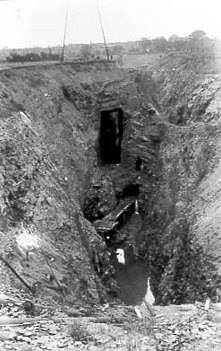 (An unexploded bomb from this raid was discovered five years later in the mud on the Thornaby side – it was successfully defused by men of the No.1 Bomb Disposal Company from Port Clarence). In the early hours of 27 August 1940 a huge crater was caused by an HE bomb in the fields behind Samphire Street in Port Clarence. Five people were injured, a number of houses were damaged and the residents were evacuated while their homes were repaired. Again the water supplies were damaged. Things were relatively quiet for about a week and then, on 3/4th September 1940, Haverton Hill was bombed. Two HE bombs hit St Vincent Street, one near Drake Street the other in the vicinity of Hawke Street. The Drake Street area was the worst affected with the water mains and sewerage systems disrupted for a number of days. Nos. 31 and 32 St Vincent Street were totally destroyed and nos. 25 and 28 had to be pulled down, as did a number of houses in Drake Street (including nos. 27,29 and 53 to 63). On the same night in Bishopton Village a stick of sixteen small bombs was dropped in a line from just east of Downlands Farm to Callender’s butcher shop which suffered a direct hit. One bomb went through the loft into the slaughter house damaging that and the garage and destroying an Austin car that was in there. The Callender family and two evacuees, who were all taking refuge in the cellar, escaped unhurt. Another bomb landed on the other side of the road, behind the village shop, destroying some greenhouses. At this time the military were expressing concern at the large number of unexploded bombs they were having to deal with. While the people of Stockton had their share of the bombing raids at this time, they had not suffered the same levels of casualties as Middlesbrough, with 68 killed, and Hartlepool,with 88 killed. Many believe this was due to the high quality of the RAF Fighter Squadrons in the vicinity and the Anti-Aircraft batteries dotted around the area preventing the German bombers getting through. After the raid of 4 September 1940, with the exception of one HE bomb dropped on the perimeter of Thornaby airfield producing a crater 30 feet deep, there was very little bombing activity until February 1941. Just before 6am on the morning of 11 February 1941, houses and shops in Newby Terrace and Port Clarence Road had their windows blown out and one HE bomb landed in Hope Street causing flooding in Clarence Street and the surrounding area. A number of houses in Cowpen Bewley Road were hit by smaller bombs which resulted in nos. 6, 8 and 22 being so badly damaged that they were later demolished. On the night of 15/16 April 1941 a raiding party of up to 300 German aircraft crossed over the area, most were destined for Manchester and Liverpool but a number of parachute mines were dropped as they passed over Thornaby at around 5:30am. One of these hit Crosthwaites Union Foundry injuring five people, one of whom later died from shock. Another parachute mine landed near Head Wrightson’s Teesdale Works causing serious damage to the mine shop, perhaps ironically this is where bomb casings were produced. Fortunately most of the workforce were still on holiday because of the Easter break. 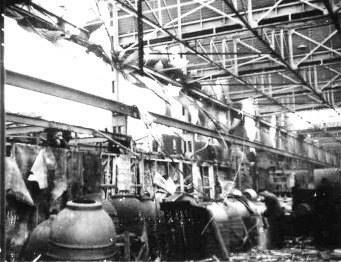 On 6/7th May 1941 considerable damage was caused to the Davy and United Roll Foundry at Haverton Hill when it was hit by one HE bomb. The Compressor House and plant were completely destroyed seriously affecting the work of the melting, moulding and dressing shops. Remarkably, production was back to normal within six days. A second HE bomb landed on Sweethills, leaving a huge crater and damaging Pearl Street, most of Victoria Street and part of King Edward Street. Most of the houses were so badly damaged that the residents had to be rehoused and eventually ten of the houses in Pearl Street (nos 1 to 19) had to be demolished. At midnight on the night of 11/12 May 1941 at least 6 HE bombs landed on the Yarm Road area of the town. Three landed in the vicinity of St Paul’s Church, Grangefield Road and Oxbridge Lane Cemetery and another blew a huge crater in the area of Bromley Road and Hartburn Avenue although this caused little damage to property. This night saw the first civilian deaths in Stockton itself when a bomb demolished two houses in Gray’s Road (Nos 5 and 7) just missing the ARP Wardens Post. Mr William Chapman, himself a firewatcher who lived at no. 7, was killed minutes after stepping outside the family shelter. His wife and family escaped injury. Two other bombs hit the Wrensfield area that night creating huge craters but causing little damage. By far the worst damage and casualties were caused near St Peter’s Church when three houses in Northcote Street (Nos 85, 87 and 89), three in Dennison Street (Nos 19, 21 and 23) and another four in St Peter’s Road (Nos 1 to 4) were all destroyed. This was the incident that killed Stockton’s youngest victim of the bombing when Edward Geoffrey Brown, who was only three weeks old, died with his parents Elsie (aged 32) and Maynard (aged 40) at their house at No 2. The family had only moved into the street the week before in the belief that they would be safer here than in their previous home near Thornaby Aerodrome. Other casualties that night were Mr Arthur Blayden (69), Ada Lamb (49) and four year old Florence Cooper, all from St Peter’s Road and Isabel Ferri (44) who all died in hospital shortly after the raid. There was a great deal of bomb blast damage to many properties in the vicinity including the Stockton and Thornaby Hospital in Bowesfield Lane. The bomb that hit Northcote Street ruptured the 33 inch water main which interrupted the water supply to most of Teesside for several days with a serious impact on local industry. Drinking water had to be boiled before use and the water supplies for firefighting were seriously affected. Two factories in Billingham were bombed the same night and four HE bombs landed near the Corporation Depot in Sun Street, Thornaby although these caused little damage as one landed in a field and the other three landed in the mud of the riverbank. The next raid happened on 12 June 1941 when an Arab seamen was killed in the area of Billingham Reach. He is buried in South Shields cemetery. On 15 August 1941 the only air raid of any consequence reported throughout the whole of the country that night hit Norton just after dark. Seven houses in Norton Avenue (Nos 152 to 164) were seriously damaged when No 160 took the full force of a HE bomb. Tragically, all seven occupants of the house were killed. Margaret Boundy aged 45 and children Alan (14), Martin(12), Elwin (14), William(7) and George (6)who were in bed and Ada Jane Allen (73) all died – some bodies were never recovered. Widow Emma Porter (64) who lived at 116 Norton Avenue was also killed and three houses in Darlington Back Lane (Nos 23, 24 and 25) and four houses in Ancaster and Alveson Roads were destroyed. Two bungalows were badly damaged near Fussick Bridge, one of which had to be demolished. Four more HE bombs were dropped that night by the same lone raider. The first causing a huge crater close to the Boundy house. The other three fell in fields in a line heading towards the Anti-Aircraft battery at Kiora Hall, which may have been the intended target. The bombs landed about 300 yards apart, in the areas now covered by Rochester Road, Radcliffe and Redditch Avenues and Riveaulx Close. On the night of 18/19th August the cottage at 16, The Green, Cowpen Bewley was severely damaged by a HE bomb that fell nearby, and a barn and farm buildings opposite collapsed when a second bomb landed close by, no-one was injured. On the same night, a parachute mine landed between Pine Street and Benson Street in Norton causing considerable damage. Twelve properties in Benson Street were destroyed (Nos 25 to 41 and 32 to 36) and in Pine Street Norton Board School was damaged. Mary Ann Hayton (83), her daughter Edith Fisher (53) and her son Earnest (21) were killed at 33 Benson Street, Harry Parks (49) and his wife Catherine (45) and Edward Lowes (37), an air-raid warden, were killed at number 35. A further 21 people were seriously injured in the attack. One of these, Edith Whipp from Junction Road who was on duty at 27 Benson Road at the time of the raid, died in hospital a few days later. A stick of four HE bombs fell in a line towards the ICI Cassel works oil tanks, but apart from some windows being blown out a Billingham North School there was little damage. The night of 5th October saw some bomb damage to four houses in Tees Street and nine in Cowpen Bewley Road which were rendered uninhabitable for a time but they were repaired and their occupants returned. Later that month, on the night of 21/22 October, a HE bomb hit the Malleable works off Portrack Lane causing little damage. The factory at this time was making heavy bomb casings and anti-torpedo equipment. For the next few months the immediate vicinity of Stockton wasn’t targeted although the rest of the region and the country generally continued to suffer. It was during this time that Hitler instigated the ‘Baedeker Raids’. This was in retaliation for the damage inflicted on the lightly defended town of Lubeck on the Baltic coast. The town had little military or industrial worth, although there were submarine factories close by. About 62% of the buildings were damaged to some extent - many of them of cultural significance, with hundreds of civilians killed and thousands made homeless by the raid. The name comes from the Baedeker Tourist Guide books, it is reported that Hitler asked Goering to bomb all English cities with a three star rating (for their cultural importance) in the guide. The raids returned with a vengeance 0n the nights of 6/7 and 7/8 of July 1942 with attacks on the ICI works. On the first night the raid lasted 52 minutes and caused 17 fires, the raid on the second night lasted 46 minutes caused 12 fires. Flares, then incendiary and HE bombs were dropped on both nights. The first serious damage was caused when an oil tank was hit by one HE bomb and the blast and flying shrapnel caused damage to other tanks nearby. The highly inflammable spirit caught fire creating havoc for the firemen of the NFS and those of the works fire brigade as they fought to contain the fires. John Down, a 61 year old firemen who lived at 64, Eamont Road, Norton lost his life on the night of 7th July – he was the only fatality. More than one million gallons of petrol were lost as a result of these raids. The damage to the surrounding area was enormous. Dozens of houses on the Belasis estate were damaged or destroyed by HE bombs with the Synthonia Club theatre taking a direct hit. Four houses in Chiltern Avenue (Nos 9 to 12) and two in Rawlinson Avenue (nos 18 and 20) were destroyed by another HE bomb which also damaged properties in Tibbersley, Windermere and the Green. On the same night enemy bombers flew through the Barrage Balloons at Billingham hitting a cable, the resulting blast injured a number of W.A.A.F. Balloon Operators on the ground. A number of properties in the area took direct hits with one HE bomb landing near the Corner House causing severe damage to an ICI Butane plant.